Local Girl Scout Troop 21129 is raising money to adopt polar bears. 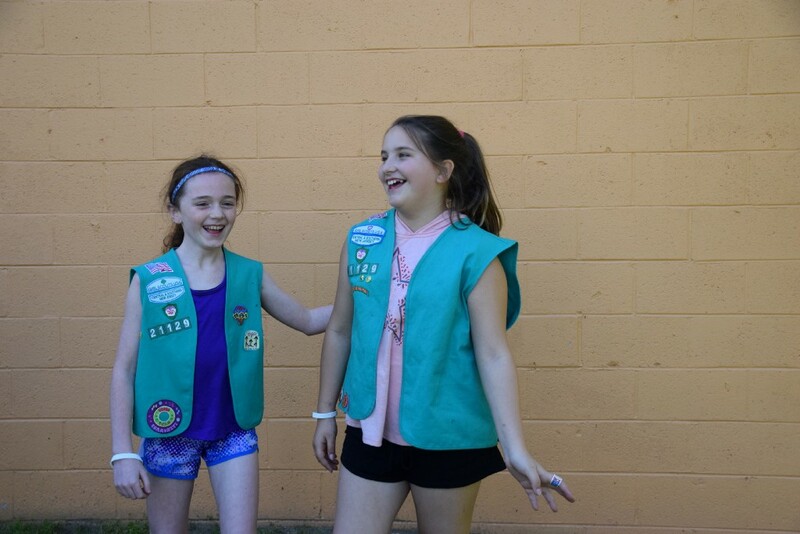 Cinnaminson Girl Scouts Brigid Hauck and Leela Colley goof around together during a May meeting. Both girls are wearing global warming awareness bracelets that they’re selling to earn their Bronze Award. Thirteen girls crowd into a small church meeting room every other week to laugh, learn and try to save the planet. 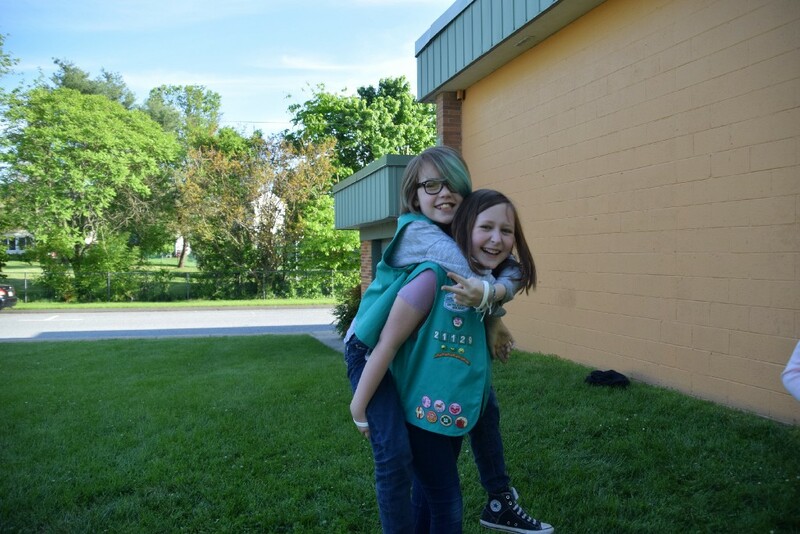 Girl Scout Troop 21129, most of which is made up of Cinnaminson fifth graders, is raising money to symbolically adopt polar bears as part of the work the girls need to earn their Bronze Awards, the highest honor Girl Scout Juniors can earn. To earn the award, the Scouts have to choose a project, come up with a plan and put the plan in motion. “We did a lot of research on why [global warming] was affecting the earth and how a lot of animals wouldn’t have a home if no one tried to change anything,” Girl Scout Brigid Hauck said. After lots of brainstorming, the Troop, comprised of 10- and 11-year-olds, decided tackling global warming was the best way to earn the award. The Scouts explained that while many animals, such as penguins, sea creatures and even reptiles, are affected by global warming, polar bears are especially harmed due to their dependence on the Arctic Sea, where the ice caps are shrinking. Because of global warming, scientists predict two third of the global polar bear population could disappear within the next 50 years, according to troop leader Carol Toth. “Polar bears are dying trying to swim to the ice, and my girls want to get the word out there and help save the polar bears,” Toth said. The troop has set its sights on raising $1,300 — enough money for each girl to adopt a polar bear through Defenders of Wildlife, a nonprofit organization that aims to protect North American animals and plants. According to Defenders, each adoption donation is immediately put to use wherever it is most needed to work toward conserving imperiled wildlife and wild lands. Kirra Kachur and Kaitlyn Bernard laugh together during a May meeting. Both girls are wearing global warming awareness bracelets that they’re selling to earn their Bronze Award. The price for a symbolic adoption includes an adoption certificate, a polar bear plush and a polar bear fact sheet. The money helps Defenders of Wildlife protect the Arctic through research and policy work designed to fight climate change, advocate against drilling and push for polar bear protection under the Endangered Species Act. To reach their goal of adopting the polar bears by this summer, the girls are selling global warming awareness bracelets at various clean up and community days, the next of which will be the Edgewater Park Community Day on June 24. Bracelets are priced at $2.50, and each girl needs to sell 40 bracelets to meet her goal. “The bracelets stay ‘stop global warming’ on them, so it can kind of help people to remember to spread the word,” Girl Scout Angelina Trembula said. Toth says the girls have done a great job at spreading the word thus far and hope to have enough adoption money very soon.